is a fun, interactive experience in which participants becoming immigrants on a quest to become "True Americans." In order to do this they must participate in a 30-40 minute orientation/assembly, take and pass a citizenship test, understand and agree with all ten Milestones of Freedom and then take the Oath of Citizenship. In America we are all under an implied Oath of Citizenship but not until now will participants truly understand what their responsibility is as a citizen of the United States of America!. In this simulated experience participants become Continental Delegates with the hope of becoming "Founding Patriots." 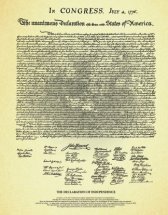 In order to do this they must participate in a 30-40 minute orientation/assembly, have an official "Convention Briefing," understand and agree with all ten Declarations of Freedom and then mutually pledge to each other their Lives, their fortunes and their sacred honor before officially signing the Declaration of Independence. Now these participants understand the principles upon which we declared our independence and the responsibility we have to uphold those principles!